Post-screening Q & A with director Pamela Yates, producer Paco de Onís, and Cesar Yoc. From a historic genocide trial to the ousting of a president, 500 Years ago tells a sweeping story of mounting resistance played out in Guatemala's recent history, through the actions and perspectives of the indigenous Mayan population, who now stand poised to re-imagine their society . In 500 Years , the Mayans lead Guatemala to a historical tipping point, from the genocide trial of former dictator General Rios Montt to the citizen's uprising that toppled President Otto Pérez Molina. 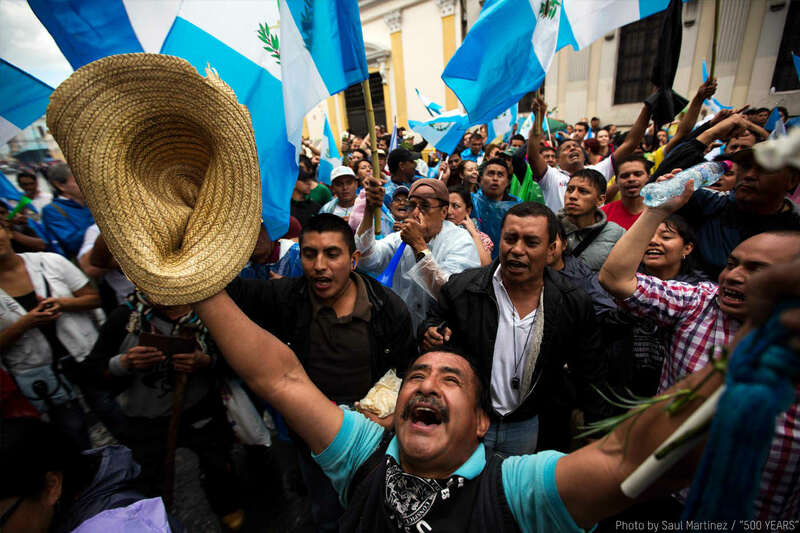 While indigenous peoples of Guatemala are not strangers to oppression, with the recent events that took place over a tumultuous three-year span, change finally seems possible when their movement is with the general public will to end corruption. 500 Years is the third and final installment in director Pamela Yates and Skylight's epic trilogy on Mayan indigenous resistance in Guatemala, The Resistance Saga, which began with When the Mountains Tremble, followed by Granito: How to Nail to Dictator. This screening was organized in partnership with Social Cinema @ New America. Habrá una sesión de preguntas y respuestas con la directora Pamela Yates y el productor Paco de Onia después de la pelicula. 500 AÑOS es la tercera y última entrega de la trilogía épica cinematográfica del cineasta, la Saga de la Resistencia, que también incluye el trabajo seminal de derechos humanos de Skylight, Cuando Las Montañas Tiemblan (1982) y Granito de Arena: Cómo Atrapar a un Dictador (2011). Esta proyección fue organizada en asociación con Social Cinema @ New America. PAMELA YATES is a co-founder of Skylight Pictures and currently the Creative Director of Skylight. She was awarded a Guggenheim fellowship for her film, Granito: How to Nail a Dictator (2011). She is the Director of the Sundance Special Jury award-winning When the Mountains Tremble; the Executive Producer of the Academy Award-winning Witness to War, and the Director of State of Fear: The Truth About Terrorism. Yates just completed Disruption, a documentary that explores innovative strategies to reduce poverty through women’s economic empowerment in Latin America. She is a member of the Academy of Motion Pictures Arts and Sciences, The Writers Guild of America, the Independent Documentary Association, and a Contributing Editor to NACLA: Report on the Americas. PACO DE ONÍS grew up in several Latin American countries during a time of dictatorships. He is the Executive Director and Executive Producer of Skylight, a human rights media organization dedicated to advancing social justice through storytelling, by creating documentary films and innovative media tools applied in long-term strategies for positive social change. Paco’s film producing credits include 500 YEARS, Granito: How to Nail a Dictator, Rebel Citizen, Disruption, State of Fear, and The Reckoning. CESAR YOC is a specialist in sustainable community development and urban planning who seeks innovative solutions to improve the ecology of the urban environment. His efforts and activism aim to create better public spaces and develop housing and new businesses that respond to the needs of Bronx residents. He grew up in the South Bronx of Maya ancestry.